The "extremists" in the Likud and the Jewish Home are a threat to Israel, says the chair of the Hatnua party. 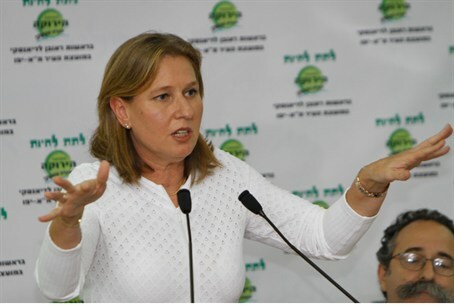 Tzipi Livni, who chairs the Hatnua party, slammed on Wednesday what she termed "the extremists" in her former party, the Likud. Livni, who visited a bar in Tel Aviv, warned that a coalition between these Likud extremists and the Jewish Home would be a threat to Israel. "Extremists are taking over our lives and if we do not stop them today - we'll end up in a situation that is dangerous for Israel," Livni said. "These extremists are now in the Likud in the form of (Moshe) Feiglin, (Tzipi) Hotovely, (Yariv) Levin and others - they are in the same party that was once a national and liberal party, and became a nationalist party which kicked out its liberalism along with whoever represented a balanced worldview such as Dan Meridor, Benny Begin and Michael Eitan," she added. "Together with them," said Livni, "are their natural partners - Naftali Bennett and the Jewish Home with a list nominated by extremist rabbis whose mission is to form a religious state." "I believe it is possible to prevent the takeover of the extremists and replace this government and its head in less than two weeks," she claimed. Livni's party has not gained the momentum she had hoped for and she has been achieving between nine and 11 seats in most polls - nowhere near the 28 she achieved when she headed Kadima in the 2009 elections. After rejecting offers to join either the Labor party led by Shelly Yechimovich or Yair Lapid's Yesh Atid party because she refused to be their number two, Livni last week called for unity in the center-left bloc. However, a night time meeting between Livni, Yechimovich and Lapid yielded no results and in fact deepened the rift between the three, when Yechimovich and Lapid accused Livni of creating a political spin and then misleading the public about it. Livni's election campaign is based on the same tactic she used when she headed the opposition in the outgoing government - attacking Prime Minister Binyamin Netanyahu and the Likud on everything. At the same time she has refused to publicly state she would refuse to join a coalition led by Netanyahu after the election. Netanyahu has made it clear that he will not let Livni be a Foreign Minister who leads talks with the Palestinian Authority. One of the Likud's campaign ads reminds voters that Livni is in favor of ceding parts of Jerusalem to Arabs as part of a peace agreement.